Back in December, when the list of 2013 Grammy Awards nominees dropped, some of Canada's biggest exports were absent from the list. While some Canadians complained that Nickelback, Feist, and 18-year old pop prodigy and pot aficionado Justin Bieber were snubbed, the folks at Toronto-based indie label Dine Alone Records were doing a happy dance. That's because the Canadian indie has three artists vying for a total of five awards at the Grammys — the Civil Wars (best song written for visual media, best country duo/group performance,) The Lumineers (best Americana album, best new artists,) and Marilyn Manson (best hard rock/metal performance). Having a Grammy nominated artist on your roster is a boon, but label president and founder Joel Carriere is hesitant to take credit for his artist's success south of the border. "For a Canadian independent label to have that many artists nominated it's certainly rare," Carriere tells Huffington Post Music Canada. "And that exposure opens a few doors for our label, but I'm more excited for the artists than I am for us. We are just a branch of the tree." Dine Alone Records launched in 2005, and established itself with releases from homegrown acts such as City and Colour, Bedouin Soundclash, Yukon Blonde, Tokyo Police Club, and Hey Rosetta!. Recently, the label has expanded signing a slew of international artists, including Billy Bragg, Kate Nash, Deer Tick, and the aforementioned Grammy nominated artists, for release in Canada. Today the label is one of the most forward-thinking indies in Canada, and one of a few with money riding on the 2013 Grammy Awards. Carriere credits the agility of his small company for that success. "Major labels have many bands and the larger acts take priority. A major just doesn't have as much time as we do to develop an act," he explains. "We maneuver quickly. We can sign bands and turn around and release a record in a month. That's not ideal, but it happens. If we have an idea, we just do it." Look at The Lumineers. There was little buzz when Dine Alone released the Denver-based folk-rock group's self-titled debut in spring 2012. Nearly a year later, powered by that ubiquitous single "Ho Hey" and the tireless effort of Dine Alone's 15 employees, the record is already certified platinum in Canada, and sales remain swift. The Lumineers passed up multiple offers for major label deals. Instead, they signed an artist-friendly deal with American indie Dualtone, and then licensed the album under similar terms to independents in other territories: Dine Alone in Canada, Inertia in Australia, and Decca Records for the rest of the world. Drummer Jeremiah Fraites tells Spinner why he and his bandmates prefer working with smaller teams. "It's just nice to work with people that are entirely engaged. You know, not just sitting in front of a computer and playing Angry Birds on their cell phones all day," he says with a laugh. He feels that at larger labels, where there is a corporate mentality, employees are less inclined to go the extra mile. "With these smaller labels, people work 12 or 15 hour days to ensure our records are in the stores, and that we're getting played at radio. We want to work with people that are as hungry as we are." Not long ago, independent record labels had little commercial clout, but the industry is changing. Adele, who is probably this era's most successful recording artist, has never signed with a major. Her juggernaut sophomore effort "21" has sold over 26 million copies worldwide and earned her independent label, the U.K's XL Recordings, a reported $67 million in profits. The music industry is evolving. Artists like The Lumineers and independent labels like Dine Alone Records are proving that artists don't need a Universal, Sony or Warner badge to attract mainstream success. With the exposure from the Grammy nod, and the buzz surrounding the group's recent appearance on "Saturday Night Live," The Lumineers seem destined to usurp the roots rock throne from reigning kings, Mumford and Sons. 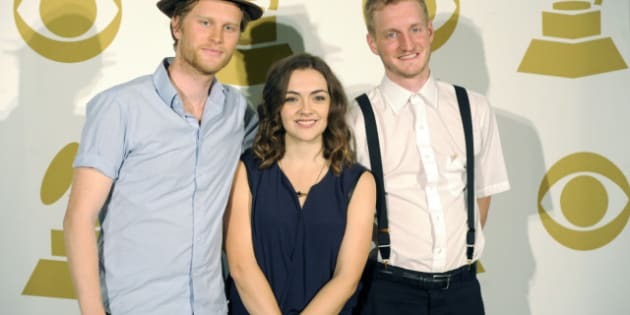 A win at the Grammy would certainly trigger a spike in record sales, and Carriere says his little label is ready to help the Lumineers face the challenges of big-time commercial success. "Every year there is that breakout band, and we are proving that we can handle that type of success and do equally as well, or better than, more established labels," he says. "And that feels really good."